SANTA CRUZ, CA--(Marketwire - April 20, 2010) - Plantronics, Inc. (NYSE: PLT), the world leader in personal audio communications for nearly 50 years, today announced the new Plantronics Explorer® 395 Bluetooth® headset. Perfect for first-time Bluetooth users, the Explorer 395 is an extremely easy-to-use headset that features a compact, classic design and high-quality audio performance at an affordable price. "Consumers buying their first Bluetooth headset are most concerned with usability. Product set up and basic operations, such as placing and receiving phone calls, must be intuitive," said Jeff Ducote, category director for Bluetooth products at Plantronics. "The Explorer 395 achieves this and goes a step further by combining simplicity with great audio quality, reliability and attractive styling." The Plantronics Explorer 395 delivers ease of use through dedicated buttons for volume, power on/off and call answer/end, which eliminate the confusion caused by a single, multi-use button. In addition, the Explorer 395 is universally compatible and includes Plantronics' QuickPair™ technology for fast and easy setup with any Bluetooth-enabled mobile phone. The Plantronics Explorer 395 features precision microphone placement and Digital Signal Processing (DSP) technology to reduce noise, echo and wind distortion, ensuring the user's voice is heard clearly and sounds natural. The DSP technology also improves inbound audio so every word is heard on both sides of the conversation. At only 11 grams, the Plantronics Explorer 395 headset is lightweight and discreet. It includes a contoured ear tip and ergonomically designed swivel earloop to provide a comfortable, stable fit. The Explorer 395 features premium design accents, including an elegant chrome finish, and is offered in black/silver and bronze/silver colors. Users will spend less time hassling with chargers thanks to the Plantronics Explorer 395's long-lasting battery, which provides up to 5 hours of talk time and up to 7 days of standby time. The Explorer 395's designated slide on/off switch enables users to further preserve battery life between calls, and conveniently auto-connects once power is restored. 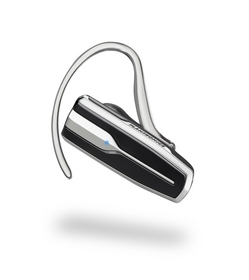 In addition to the Plantronics Explorer 395, Plantronics also introduced the Plantronics Explorer 240 Bluetooth headset. The Plantronics Explorer 395 Bluetooth headset has a retail price of $49.95 and is available at BestBuy.com and www.plantronics.com today. The Explorer 395 will be available exclusively at BestBuy through June, and at Apple and Sprint stores this summer. The Plantronics Explorer 240 has a retail price of $39.95 and exclusive variants are available now at AT&T, RadioShack, Target, T-Mobile, and Verizon, and Frys and WalMart soon. For more information about the Plantronics Explorer 395 and the Plantronics Explorer 240, please visit: www.plantronics.com/explorer395 and www.plantronics.com/explorer240. Plantronics is a world leader in personal audio communications for professionals and consumers. From unified communication solutions to Bluetooth headsets, Plantronics delivers unparalleled audio experiences and quality that reflect our nearly 50 years of innovation and customer commitment. Plantronics is used by every company in the Fortune 100 and is the headset of choice for air traffic control, 911 dispatch and the New York Stock Exchange. For more information, please visit www.plantronics.com or call (800) 544-4660. Plantronics, Plantronics Explorer, and QuickPair are trademarks or registered trademarks of Plantronics, Inc. The Bluetooth® word mark and logos are registered trademarks of Bluetooth SIG, Inc. and any use of such marks by Plantronics is under license. All other trademarks are property of their respective owners.